My birthday was October 3, and I had a wonderful week of celebration! To kick-start the celebration week, on my birthday, I got together with a couple of friends and they took me out for dinner. On every birthday of past years, I have been opening a bottle of Jacques Selosse. Last year was Brut Rose. 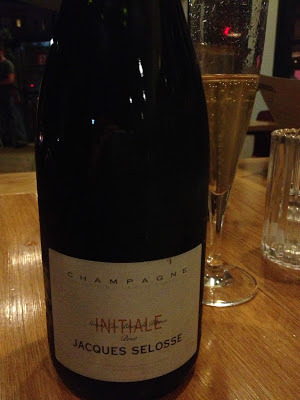 This year, I decided to open Jacques Selosse's signature, Brut Initial (Blanc des Blancs from three Grand Cru vineyards, disgorged in 2008) again. It's because I wanted to celebrate my new first step! 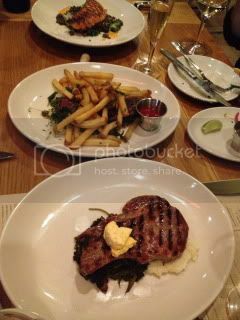 We had dinner at Messhall Kitchen in Los Feliz. Everything was really good. These are main course trio...hard-wood grilled salmon was very nice. 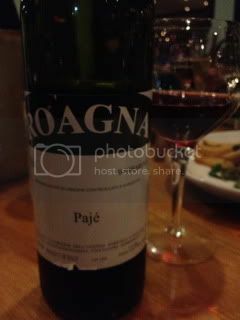 And, the "Butcher's Steak" was especially nice with 2004 Roagna, Barbaresco, "Paje". I love the old-world style Barbaresco very much. Jason joined us later in the evening.